You can open a door from inside the vehicle even if it has been locked. You can only open the rear doors from inside the vehicle if they are not secured by the child-proof locks . If the vehicle has been locked with the SmartKey or with KEYLESS-GO, opening a door from the inside will trigger the anti-theft alarm system. Switch off the alarm . ■ Front door: pull door handle 2. 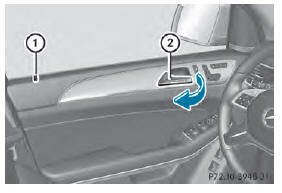 ■ Rear door: pull up locking knob 1 on the relevant rear door. The rear door is unlocked and can be opened.